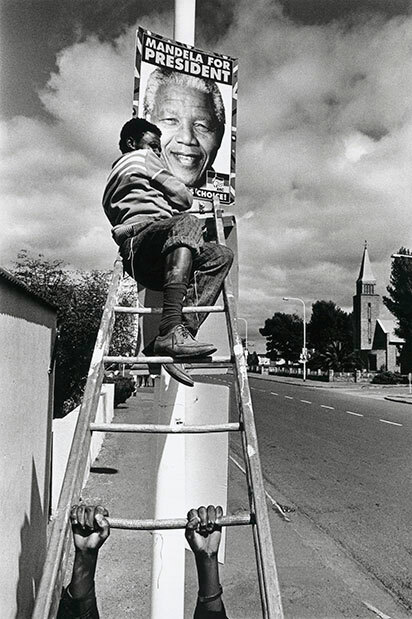 ANC campaign workers hang posters of their presidential candidate Nelson Mandela. 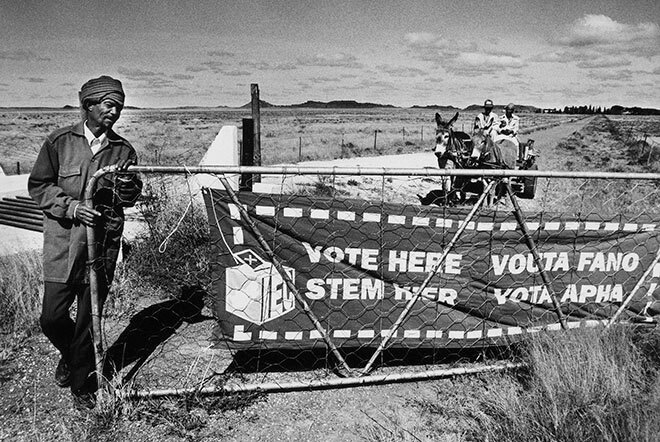 In April 1994, after decades of apartheid and oppression, black South Africans were able to vote for the first time. For the global media this was a highly anticipated news event. Thousands of journalists and photographers worked to capture what was arguably one of the most significant events in the history of democracy. I chose to make my focus a remote, conservative town called De Aar in the Karroo desert, away from the other media and close to the geographical centre of South Africa. The name De Aar means ‘The Artery’, referring to the underground water supply beneath the town. 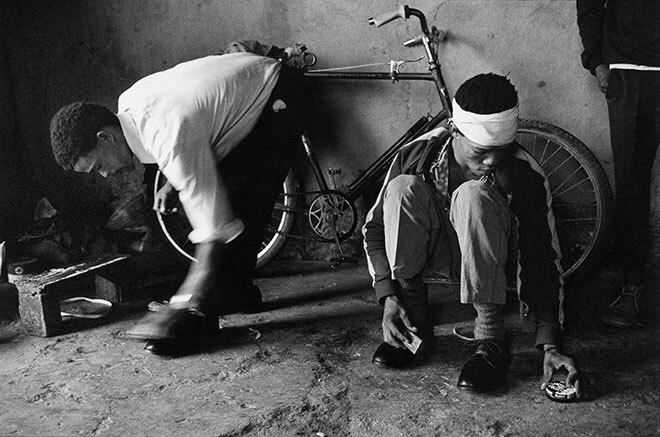 Having grown up under apartheid, these days were immensely significant to me. 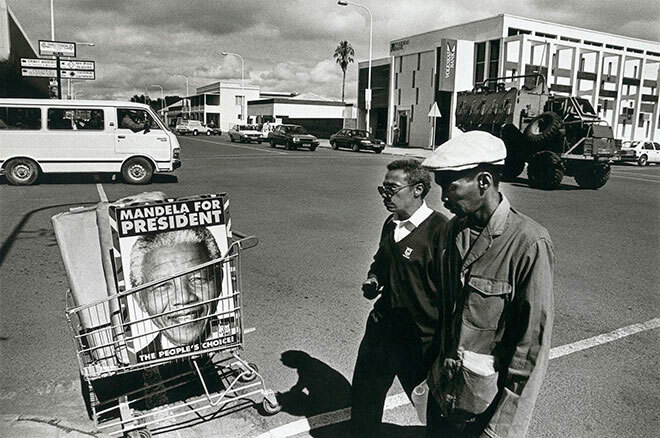 I had a moment of disbelief as I witnessed ANC election workers putting up posters of Nelson Mandela on the main street of the town, just four years after his release from prison. 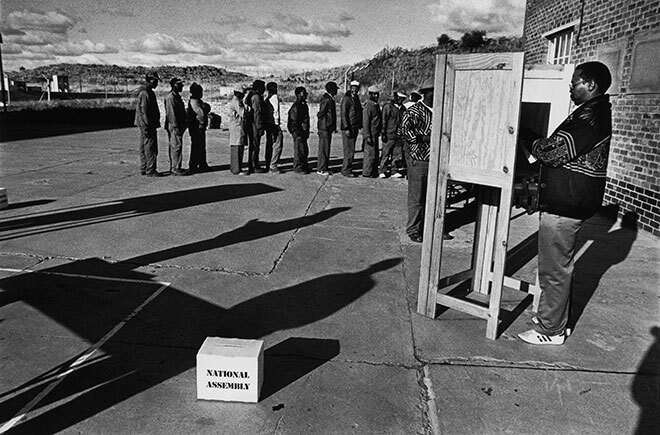 Early in the morning on the day of the election I joined a group of formerly disenfranchised farm workers as they polished their shoes and put on their best clothes before leaving home to vote for the first time in their lives. 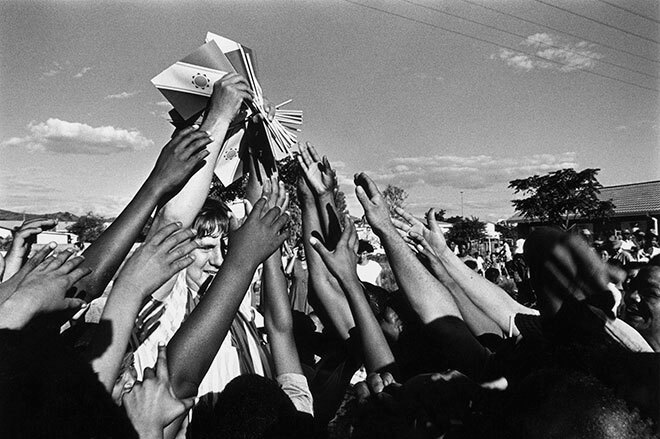 With the passing of time and the disillusionment that has set in for so many in the new South Africa, these images still feel important to me, holding within them a timeless and poignant sense of hope. The wife of the local Nationalist Party parliamentarian opens her arms to greet some new members. The party, previously open only to whites, was trying to recruit new black members during this election campaign. A security vehicle drives past ANC campaign workers, preparing to put up posters of their presidential candidate Nelson Mandela. 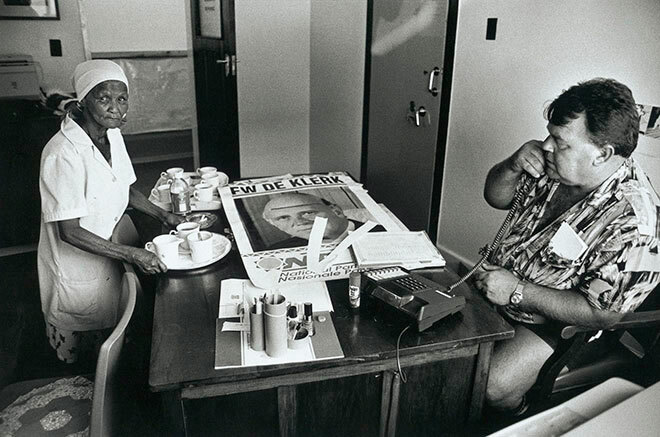 Campaign worker Gerhard Pienaar is served tea in the Nationalist Party offices. He was campaigning on behalf of F.W. de Klerk, who helped lead the white ruling party towards majority. A Nationalist Party campaign worker hands out miniature party flags to supporters during a political rally. 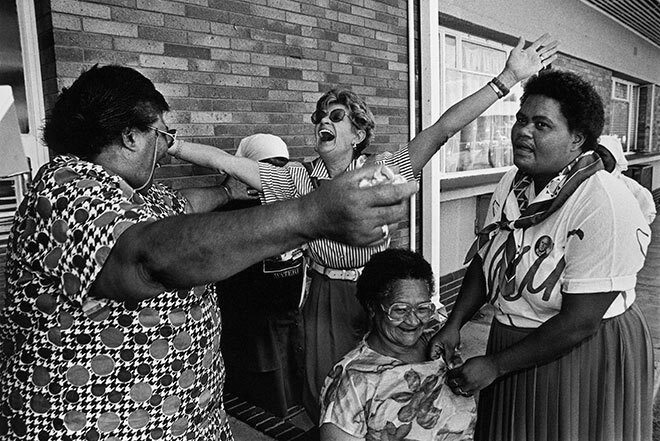 Despite years of representing white interests, the national party was trying to recruit members in black communities. Workers at a factory take part in a mock election as part of a nationwide election-training programme. 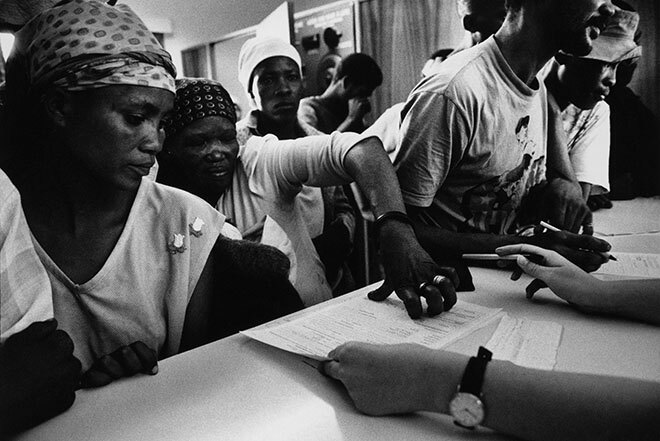 An illiterate farmworker makes a thumbprint signature as she registers to vote for the first time in her life. 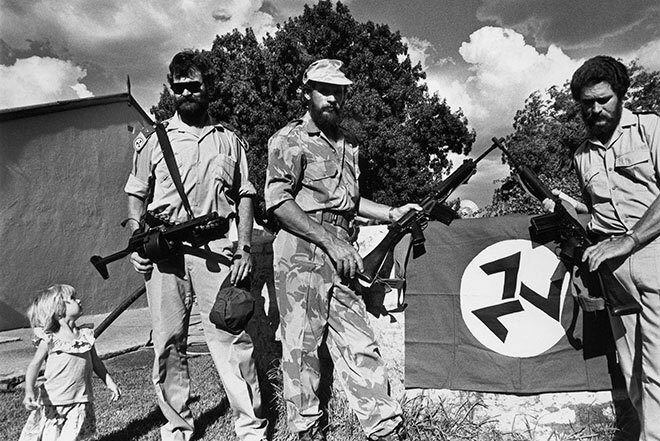 Members of the Afrikaner Resistance Movement (AWB), a neo-Nazi group, pose with assault rifles and their party flag. Their party was threatening to use violence to disrupt the upcoming election. 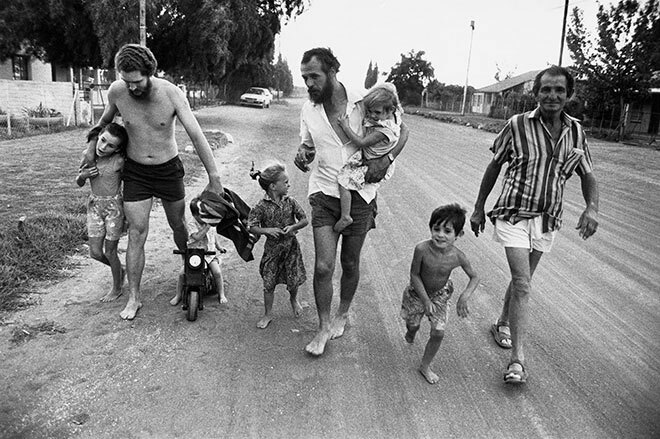 Members of the Afrikaner Resistance Movement, a neo-Nazi group, walk their children to a private swimming pool belonging to friends on the outskirts of town. They refused to use the town’s public pool, which had just been opened to all races. Two young farmworkers polish their shoes and put on their smartest clothes as they prepare to vote for the first time in their lives. It is April 27th, the day of the country’s first free vote. The entrance to a remote, rural voting station in the Karroo semi-desert. 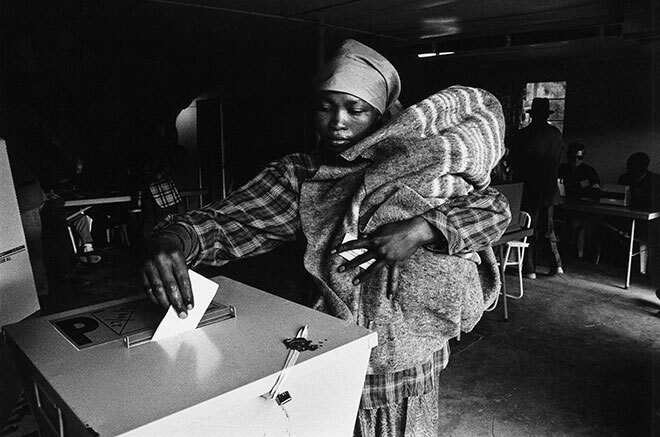 A woman marks her ballot paper, voting for the first time in her life. 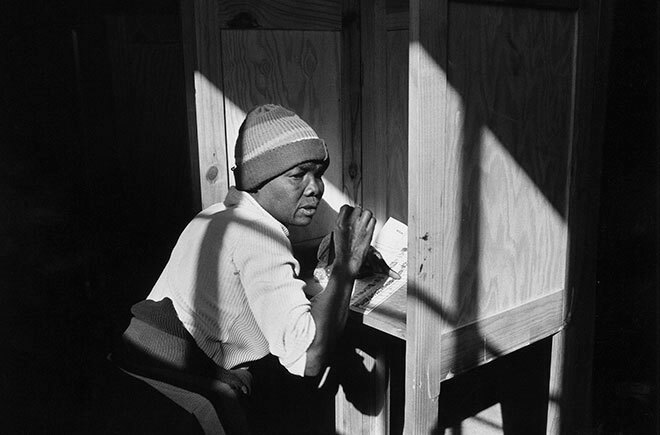 A farmworker places her ballot paper in the ballot box, voting for the first time in her life. 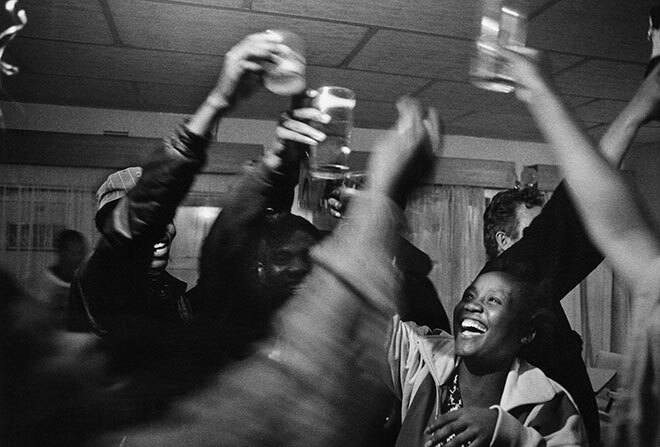 ANC campaign workers make a toast during a victory party following the news that their party had won the nationwide election and their leader Nelson Mandela was elected president. A group of children of different races play in the Olympic-sized public swimming pool. 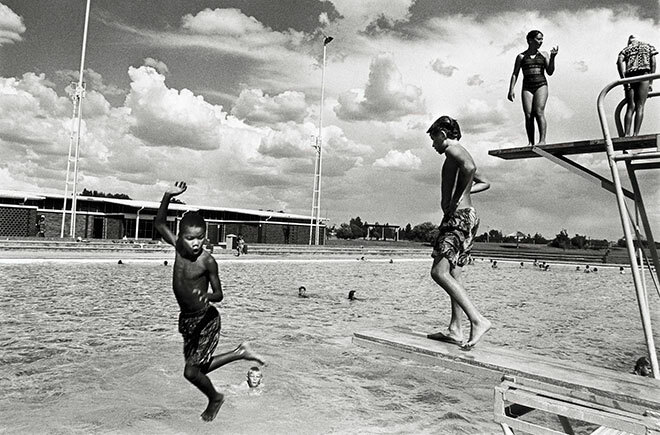 This was the site of a notorious attack, where members of the neo-Nazi AWB had beaten up a group of black children who used the pool shortly after it had been opened to all races.